We stock all sizes of Ford and Smith-Blair repair clamps, pipe couplings, and transition couplings to help you fix that leak or break ASAP. 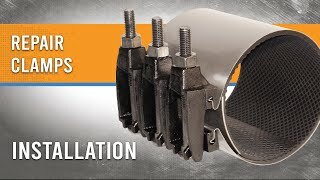 Ford’s recent update to the FS stainless steel repair clamp is the FLS with drop-in bolt design and no lifter bar for a smoother wrap and installation. Ford’s F1 repair clamp is light and easy to install with a drop-in bolt design so loose bolts don’t need to be removed and reinstalled. The F1 is available in 1″ – 12″ and is available with 3/4″ – 2″ taps. F2 clamps come in two sections, allowing for a wider range for a single clamp as well as expanding the size range for repairs up to 20″ pipe. The F2 is available with 3/4″ – 2″ NPT or CC taps. The FS1 repair clamp offers the same easy installation as the F1 but with all stainless steel lugs and hardware for a longer lasting repair. The FS1 is available with 3/4″ – 2″ NPT or CC taps. The FS2 is a double band clamp which allows for repairs of larger sized pipe and allows for a slightly wider range that each clamp can cover. This clamp comes with all stainless steel lugs and hardware. 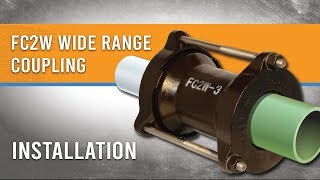 The FS2 is available with 3/4″ – 2″ NPT or CC taps. Ford’s FSC Snap Clamp is suitable for repairing pin hole leaks or other minor damage to steel or PVC pipe from 1/2″ through 8″. Snap clamps come in 3″, 6″, 9″, or 12″ lengths. Ford’s FSC-R Wrap Clamp offers full wrap protection for minor repairs to 1/2″ – 2″ steel, PVC, or copper tubing. 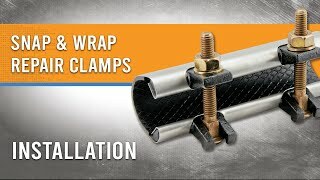 Wrap clamps come in 3″ and 6″ lengths. Ford’s FLSC Snap Clamp is suitable for repairing pin hole leaks or other minor damage to steel or PVC pipe from 1/2″ through 8″. Snap clamps come in 3″, 6″, 9″, or 12″ lengths and the FLSC comes with all stainless steel hardware and lugs for a longer-lasting repair. Ford’s FLSC-R Wrap Clamp offers full wrap protection for pin hole repairs to 1/2″ – 2″ steel, PVC, or copper tubing. Wrap clamps come in 3″ and 6″ lengths and the FLSC-R also has all stainless steel bolts, nuts, and lugs. Smith-Blair’s 226 repair clamp is available for 2″ – 14″ pipe and it comes with drop-in bolts and removable epoxy coated lugs for easier installation. Smith-Blair’s tapped model is the 238. Use Smith-Blair’s 227 Double Band Full Circle Repair Clamp for holes, cracks, or breaks in any pipe material. The 227 comes standard with epoxy coated removable lugs and is available for sizes 3″ – 12″. Smith-Blair’s tapped double band clamp is the 239. The 238 is Smith-Blair’s tapped single band repair clamp for pipe sizes 3″ – 12″. Epoxy coated ductile iron lugs are standard and taps range from 3/4″ – 2″. Smith-Blair’s non-tapped single band clamp is the 226. The 239 Double Band Tapped Repair Clamp is available for 4″ – 12″ pipe with 3/4″ – 2″ taps. Smith-Blair’s non-tapped double band repair clamp is the 227. For use with steel, copper, PVC, and HDPE pipe, the 244 Full Circle Redi-Clamp is best suited to repair small splits or pin holes on 1/2″ – 2″ pipe. These come in 3″, 6″, or 12″ long sleeves and are specific to IPS and copper tube size outside diameters. The 244 features a full wrap band for better protection. Smith-Blair’s 245 Redi-Clamp is an economical way to repair pin holes or minor splits in steel, PVC, HDPE, or copper tubing. Avaiable in 3″, 6″, 9″, and 12″ widths for 1/2″ – 8″ and up. Drop-in bolts and epoxy coated lugs make for easy set it and forget it installations. For use with steel, copper, PVC, and HDPE pipe, the 247 Full Circle Redi-Clamp is best suited to repair small splits or pin holes on 1/2″ – 2″ pipe. These come in 3″ and 6″ long sleeves and are specific to IPS and copper tube size outside diameters. The 247 features a full wrap band for better protection and all stainless steel lugs and hardware. Smith-Blair’s 248 Redi-Clamp is designed to repair pin holes or minor splits in steel, PVC, HDPE, or copper tubing. Avaiable in 3″, 6″, 9″, and 12″ widths for 1/2″ – 8″ and up. Drop-in bolts and epoxy coated lugs make for easy set it and forget it installations and the 248 features all stainless steel lugs and hardware. Ford’s FC1 pipe coupling can be ordered with epoxy coating or stainless steel bolts and nuts. Available in 2″ – 12″. 411 Couplings are sized for steel, ductile, or cast iron pipe outside diameters, with standard sizes 2″ – 12″ and larger diameters going up to 60″. All Smith-Blair couplings are epoxy coated. Ford’s Ultra-Flex offers a wider OD range for more wiggle room and is available in 3″ – 16″. Smith-Blair’s wide range steel coupling offers extra wiggle room for lower or higher than normal outside diameters. The 461 fits 1-1/2″ to 12″ pipe, and the longer sleeve 462 fits 4″ – 12″. With two bolts to tighten instead of four and a wide outside diameter range, the Hymax coupling has become very popular because installation is so simple. Ford FC2A couplings help join pipe of the same nominal size but with different outside diameters. The end rings are color coded to make joining two different pipe materials a breeze. The FC2A is available with epoxy coating and stainless steel hardware. Smith-Blair’s OMNI couplings allow for easy coupling of different pipe materials with different outside diameters within a specific nominal pipe size. All OMNI couplings are epoxy coated and stainless steel bolts and nuts are available. Mix and match follower flanges to join nearly any combination of pipe O.D.s with the OMNI.